June 13, 2014 - The U.S. had no business invading Iraq. We toppled a dictatorship on a false 9/11 rationale, which plunged Iraq into a sectarian civil war inside a war with the United States. We left behind a vengeance-driven Shiite regime aligned with Iran. Now the sectarian war in Syria is enlarging into a regional one. The primary blame for this disaster is on the Bush administration, but also on all those who succumbed to a Superpower Syndrome, which said we could redesign the Middle East. There is no reason whatsoever to justify further loss of American lives or tax dollars on a conflict that we do not understand and that started before the United States was born. Anti-war networks already are sending online messages to Congress opposing any U.S. military re-intervention in Iraq. Representative Nancy Pelosi already is there. Those voices need to be amplified to help President Barack Obama stave off the most irrational forces during this crisis. Then we need to construct a narrative that blocks the hawks from blaming Obama for "losing" Iraq, and turns the focus on the neo-conservatives, Republicans, and Democratic hawks who took this country into a sea of blood. Most of them remain in power, unscathed and immune, even occupying high positions in this administration. What they fear most is not an Iraqi insurgency, but the risen families of the dead and wounded, on all sides, that increasingly ask who led them into an unwinnable, unaffordable war. The duty-driven bravery of their lost sons and daughters stands in direct contrast to shameless privilege of those who sent them into harm's way. As this immediate crisis unfolds, we must act to strip away certain delusions. The least of these, though still irritating, is the view of many visible anti-war "radicals" that says the United States never really withdrew from Iraq, but instead secretly left behind tens of thousands of Special Forces in disguise. This silly notion was meant to refute the belief that Obama had "ended" the war. Where are those secret U.S. legions today? Not on the battlefield obviously. Now as we engage in the discussion of "losing" Iraq, it is not helpful to claim that the U.S. never withdrew. Instead we have to defend the withdrawal and its consequences, which will reopen deep divisions in America's political culture. The second and far more widespread delusion is that of the neo-liberals and neo-conservatives that we could construct, through force of arms, a democratic and unified Iraqi state in which sectarian divisions would float away in a flood of free enterprise and oil revenue. The truth is that a sectarian struggle long preceded the American invasion, was held in check only by the dictatorship of Saddam Hussein, and was reignited by the U.S. military overthrow of a Sunni-led regime. It is profoundly shameful to hear American officials cluck-cluck about the supposed "excesses" of the Shiite al-Maliki regime that they installed; the thousands of Sunnis being marginalized, imprisoned, tortured, denied employment and political representation, when all this revenge was foretold and could not be forestalled forever. There is no doubt that Iraq was a Sunni-dominated dictatorship under Saddam, but it also had a middle class, higher education, and an economy that employed many people in state-owned enterprises. Though a dictatorship, it was prosperous for many, at least according to Middle East standards. Its enemies were very understandably the Shiite population, but also the crackpot Republican neo-cons with their faith-based privatization schemes, and many in the Israeli and American national security complex that long feared armed Arab nationalism. The latter group's support for the Shiites was purely opportunistic. It was based on yet another delusion, that religious Islam could be managed while Arab secular nationalism posed the greater security threat. One of the leading militants on the road to Baghdad today is Izzat Ibrahim al-Douri, a Baath Party military commander who was on the also delusional "deck of cards" displayed by the Pentagon public relations officers. Al-Douri stopped yesterday at the grave of Saddam Hussein before resuming his vengeful ride with jihadists towards Baghdad. If the central power is sufficiently weakened, there is no real civil society to hold the polity together, no real sense of common identity...The state then disintegrates...into a chaos of squabbling, feuding, fighting sects, tribes, regions, and parties. An Iraq split into three semi-autonomous mini-states, or an Iraq in civil war, means that the kind of threat posed by Hussein...is unlikely to rise again. This is what is presently happening. Because of the sectarian war in Syria, the Sunnis of Iraq have a massive "rear base" from which to launch their insurgency. By one estimate in the New York Times, their fighting force is only 3,000 to 5,000 combatants, a tiny fraction of the massive and rapidly crumbling Iraqi army. 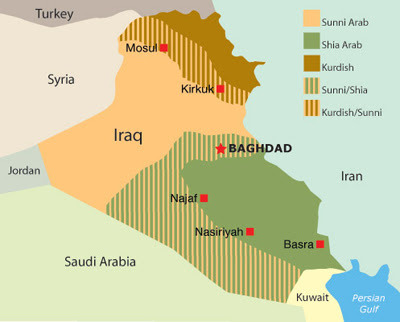 The march to Baghdad may well be blocked militarily, unless the al-Maliki regime simply crumbles from within. But Iraq will be divided between its Sunnis in the northern provinces, the Kurds in Kurdistan, and Shiites in the south, who may at any time split and revolt against al-Maliki under the lead of the Sadrists. From the Bernard Lewis perspective, that would be "Mission Accomplished." From another perspective, it will be Machiavellianism run amok without term limits. Since the real scenario cannot be explained to the American public, the scapegoating will begin. Follow Tom Hayden on Twitter: www.twitter.com/@TomEHayden Hayden is a Former State Senator and leader of sixties peace, justice and environmental movement. Director of the Peace and Justice Resource Center.